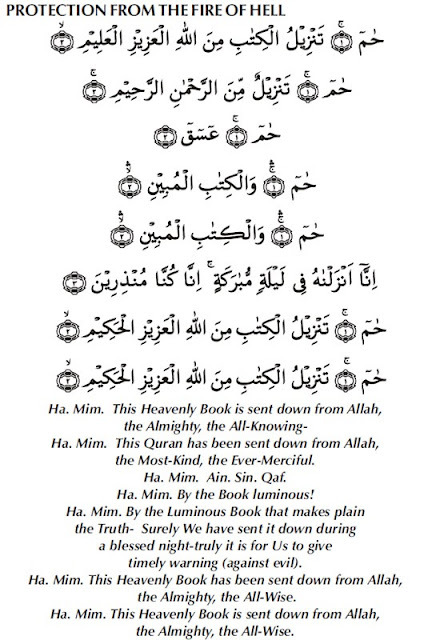 Recite Ha-Mim seven times,1st Recite Ha-Mim and then blow to your right side, 2nd Recite Ha-Mim and blow to your left side, 3rd Recite Ha-Mim and blow in Front of yourself, then 4th Recite Ha-Mim and then blow behide your back. 5th Recite Ha-Mim and then up into the air. 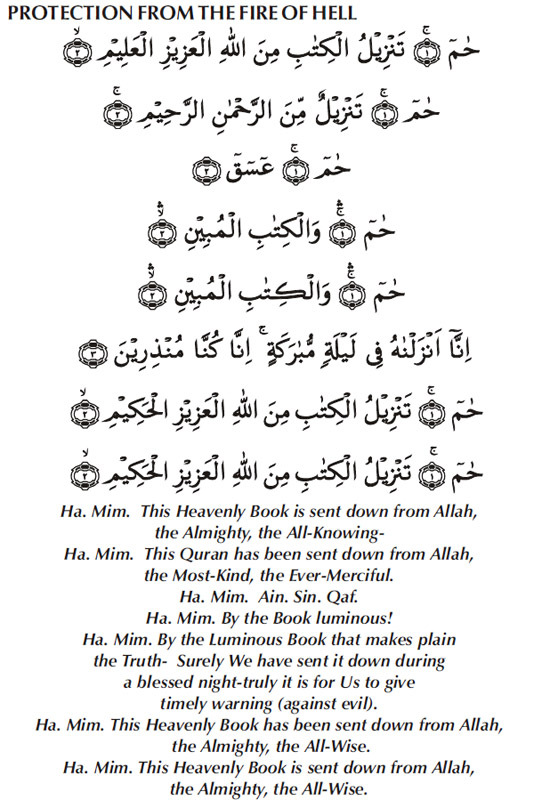 6th Recite Ha-Mim and blow down below. finally 7th Recite Ha-Mim and then blow across into hands and rub across chest and all over over your body. As for Blowing; know that Shaytan blows on you and does other Vileness to the Son of Adam too "Shaitan puts three knots at the back of the head of any of you if he is asleep. On every knot he reads and( blows) the following words, 'The night is long, so stay asleep.' When one wakes up and remembers Allah, one knot is undone; and when one performs ablution, the second knot is undone, and when one prays the third knot is undone and one gets up energetic with a good heart in the morning; otherwise one gets up lazy and with a mischievous heart." The other Vileness of Shaytan So he blows duas to make you lazy and sleep long and miss Fajr, And if you Miss Fajr salah, then Shaytan URINATES in your ear,(As-salaatu khayrun min an-nawm- and so' Pray is better than Sleep') and thus uses your ear as toliet,he stays up your nose when you sleep (he should wash his nose by putting water in it and then blowing it out thrice in wudu ), when any baby is born he pokes or pinches that baby so that baby cries (except Jesus, the son of Mary and Mary), he passes wind (farts) at when both the Adhan and Iqama is said and causes issues while in Salah too, such as causing forgetfulness of rakah. Shaytan eats your food if you dont say Bismillah and sleeps (gate crashs your house if you dont give salam as you enter your homes) and will even join in with sexual acts if you dont say Bismillah when you enter your wives, and laughs and looks at your private parts when you undress thus say Bismillah when you undress your private parts or pull down your clothes when going to the toliet and then evil Jinns and devils will not be able to see your 'awra- or naknesses. and Shaytan will enter you if you yawn thus its sunnah to cover your mouth when you yawn and if you are anger Shaytan runs through your blood. So learn to be calm when angered. And also from Surah Nas 114 we are told another one the 7 ways or directions of Shaytan enters the Heart,"4.From evil of the whisperer, 5. Who whispers in the breasts of mankind, 6. Of jinn and men." Surah Nas 114:4-6. Al-Hafidh Abu Ya'la Musily quoted a Hadith which reported the Prophet as saying: "Satan puts his hand on the heart of man. If he celebrates the remembrance of Allah he removes his hand and if he forgets Allah, Satan overcomes his heart fully. This is the 'evil of the whisperer.' " Ibn 'Abbas, says that the Satan is lying in wait for man. When he forgets Allah, he starts whispering, and when he begins the remembrance of Allah, he retreats. And one sees now the importance of finally the 7th Reciting of Ha-Mim and then blow across into ones hands and rub across (chest-Heart-Sadr). These are the 7 directions for protection from shaytan while he lies to ambush from all 7 directions. Also these are the same ways Jinns can attack or enter a human body when black magic is used. As the Sorceries when they blow knots on people to destroy them or have them control by Jinn, they are blowing knots on the victims personal clothes or personal hair (normally underwear/bra or pubic hair, menstrual blood such as Pads and Tampons are stolen from the victims homes/bins. Also Nails, as for Nails its best to always cut them while in wudu thus they leave your body while in a state of cleanliness and can't be affected with magic and is Sunnah to cut nails while in Wudu on Fridays too) as "annafathati fee al-'uqad", literally "those who blow on knots". Surah al Falaq-(Surah 113:4) So in effect the blowing of Ha-Mim makes a shield or amulet from the attacks from evil, Jinns and magic from all 7 directions. Also Shaykh Muhammad Yaqoubi mentions, there are also 7 surahs that start with Haa-Meem. Each Ha-Meem, is refering to each of those surahs.